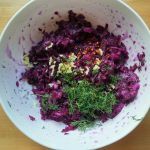 I’m nuts about this fermented purple cabbage recipe or anything fermented really. This is probably because they are exceptionally healthy for us and are quick to make. For any one that is new here, welcome. 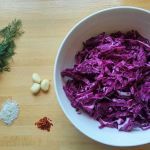 Here you can find posts I’ve written about the fermentation process and why it’s healthy for us. In a few words, fermentation is an ancient process that preserves food and beverages, the earliest signs date back to 7000BC, as evidence suggests, in Jiahu, China’s Henan Province, where traces of fermented beverages were found in vessels. 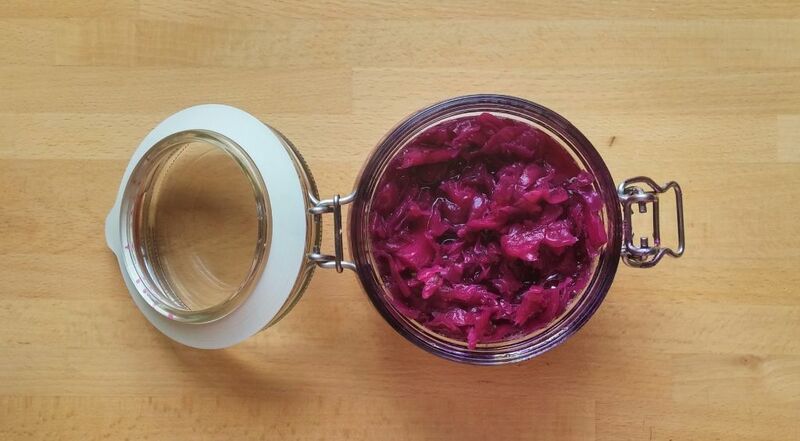 Let’s brighten up our guts with this delicious, spicy Lacto fermented recipe. 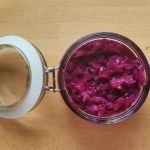 So today I’ll show you how you can easily Lacto ferment almost any vegetable in order to preserve it and enjoy from it’s great health benefits. First of all save 1 cabbage leaf for later. Then finely slice the cabbage and place in a bowl. Add the sea salt and give it a quick toss. This is so that the salt can already start to release the juice from the cabbage while we prepare the rest of our ingredients. Once you have prepared the rest of your ingredients, start working those hands, massaging the cabbage until you notice a fair bit of juice coming out and the cabbage has shrunk, about 5 minutes. Chop up the fresh dill, crush the garlic and ginger and add the chili flakes. You can wear gloves for this part if you don’t want to smell of garlic afterwards, massage it all in for an extra minute. Transfer your nearly fermented purple cabbage into an air locked glass jar, don’t worry, it will all fit in with a little force. Cover with the cabbage leaf from earlier, making sure that it is jammed in and won’t float later on. 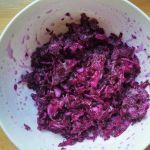 It is important that all of the fermented cabbage is under the liquid otherwise it will grow mold. And that you have about an inch of room from the top of your jar, or you’ll end up with a mess later on.